The holiday season is a time to be grateful for friends, family and community. For me, that gratitude includes the small businesses who are a part of my everyday life in California. From my friends at Zombie Runner whose post-run coffee is the best part of my workout, to the folks at Tin-Pot Creamery who make it impossible to give up ice cream; these small businesses make my day-to-day life better and add heart to our community, and for that, I am thankful. I firmly believe when we support the businesses we love, we make the places we live better. I also spend much of my time at work thinking about how to help small businesses grow using the web. 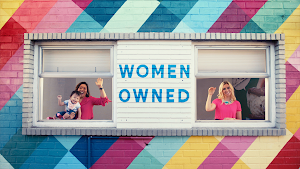 Our products play a pivotal role in helping people and small businesses connect with each other. As this year’s holiday shopping season and Small Business Saturday approach us, we’re doing something extra to help small businesses stand out and succeed, both online and in their neighborhoods. Reviews from your fans are like digital thank you notes, and they’re one of the first things people notice about your business in search results. A few positive small thanks can mean the difference between a potential customer choosing your business or going elsewhere. 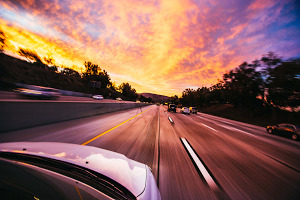 71 percent of consumers say that positive reviews in search results make them more likely to use that the business, and listings with positive reviews see 360 percent higher clicks to their site. Show why your customers love you with posters in your store, and posts on social media. Here are a few tips on how to use the materials from the #SmallThanks Hub to gain new customers and turn existing ones into advocates. Personalize your assets: Choose the reviews you want to feature, and select from several layouts, colors and styles to match your business’s aesthetics. You can create as many versions as you want. 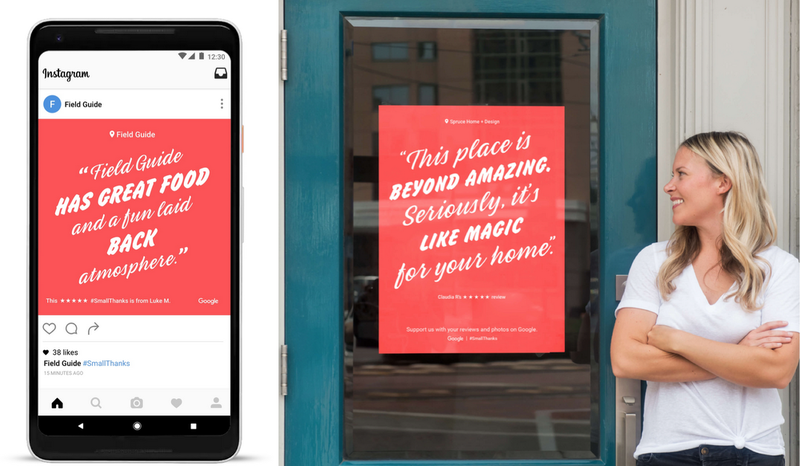 Show why your customers love you: Print and hang your customized posters in a visible area in your store, and share the social media versions with #SmallThanks to join in the conversation and show what makes you unique. Post the flyers around your neighborhood where potential customers might see them. Ask customers to support you with reviews: Some customers may not remember to leave you a review, or realize the impact that it can have, so why not give them a little nudge? Place stickers in your window, receipt booklets, point-of-sale machine or anywhere else it can be prominently displayed to remind them to support you with a review. Remind people to search for you: Post the “Find us on Google” stickers in your store and on your social media channels with #SmallThanks hashtag to tell potential customers how to connect with you. Keep your Google listing up to date: The holiday season usually means different hours and special offerings. Let customers know when you’ll be open using the special hours feature, and promote holiday specials with Local Posts. 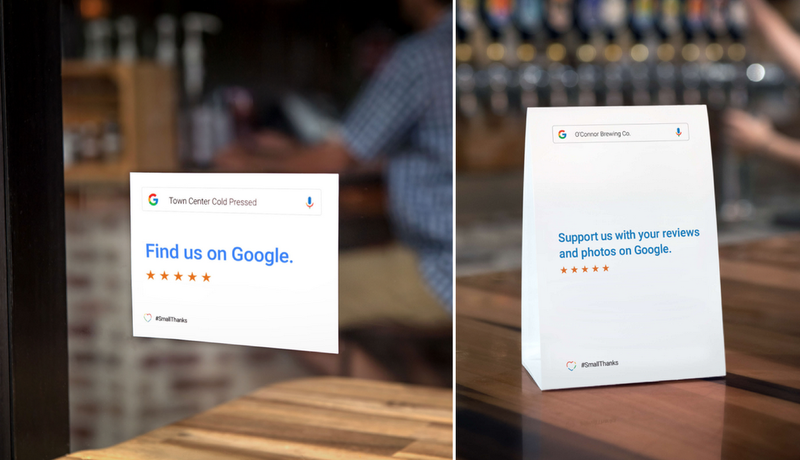 Encourage customers to support you on Google by placing these in visible spots. Happy holidays and best wishes from all of us at Google.